Finally some proper light today! I took advantage of it by taking some pictures of some fairly recent creations as worn by me (some of those I've never worn combined like this, but I'm sure I will). Click on the pictures to make them bigger (yes, these are a bit bigger). My apologies for all the similar poses and self-timer faces. It seems that contrary to what I thought, blogger does not enlarge the pictures when clicked (I'd swear I've seen and used that feature on other blogger-blogs...) so I have uploaded them a size bigger. First up: flared trousers and jacket in charcoal grey wool, here worn as a suit with a ruffly top underneath. The top was made of fabric left over from my flowy white shirt. It's a simple sleeveless number, decorated with three rows of circular ruffles. Then: the same jacket with the belt pleated trousers and the heart t-shirt for a very different looking suit. Four: Karin asked for it, and I had been thinking about it myself as well. 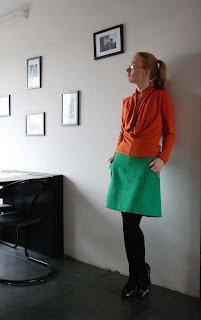 The green skirt with the orange top. It actually looks fine in the picture, but in reality, it doesn't really work. The green is really eye-poppingly bright (the camera's sensors don't seem to be able to cope with that) and the orange is a bit muted in comparison. And finally, this is something I'm not so sure about. I've made this skirt two years ago, and I still love it. The top, however is a different story. I bought the fabric at the spring fabric market last year, having fallen in love with that flowy, almost art nouveau style, print. However, it is also quite shiny, which always scared me a bit. The size of the print (and the weight of the fabric) meant it had to be made into something unstructured. Those are all nice garments, together and seperately. Unfortunately, the photos don't enlarge, but from a distance photo, they look great. I couldn't get the photos to enlarge, but they look fantastic, as usual. You look very stylish. I agree with you on the orange and green, but they are both beautiful garments and with other separates would look very lovely. Thanks for your comment! I will probably get some of the brighter, warmer linens, when I've got more space in my fabric shelf!! Your outfits are just perfect and beautiful. I love the structure of the jacket, although the grey wool skirt is my absolute favorite. You have real talent...I'm jealous.